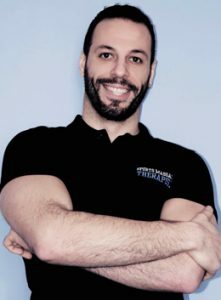 Emil is a professional Sports and Remedial Massage Therapist who delivers a very professional and Holistic deep tissue massage combined with myofascial release techniques to achieve an optimal state of relaxation in the soft tissue. Emil is very passionate with sports and gym training and will provide the ideal treatment to promote your muscle growth and recovery, reducing the risk of injuries. Emil's massage will also release the tension that inevitably builds up through sedentary lifestyle and work and to alleviate the aches and pains caused by bad posture habits. Emil is qualified in Sports Massage (level 3) and in Clinical and Remedial Soft Tissue Therapy (level 5). He is also a member of the Federation of Holistic Therapists (FHT).